Awamori is Okinawa’s traditional liquor, and now it has a new flavor thanks to a Naha woman. GENKOKU is the newest name on the awamori shelf, and it’s more than simple awamori. Consider it an Okinawan herbal liqueur, distilled with nine distinctly unique herbs. Genkoku’s medicinal effects are traditional, well known and long in use in Okinawan homes. A friend brought her some herbs, and she began tinkering. She still has a portion of the first herbal awamori distilled in the store’s back room in ’94. Convinced there was an interest and a market, Oyazato teamed up with a laboratory to develop the perfect combination. Three years of product development and testing, and the Genkoku was ready for the market nearly three years ago. It cost Oyazato Y15,000,000 to create Genkoku. Genkoku is unique. It is awamori with posture. Likcorice, Matrimony Vine, Cinnamomum Okinawense, Polyporaceae, Lobster Eucalyptus, Termeric, Sufflower, Reishi and Gardenia Jasminoides are skillfully blended and steeped into an awamori mixture at a plant in Nago. What began as a six-months distilling process is now made simple by a unique electrolysis technology that infuses the awamori with the herbs in several weeks. The process is kept small to maintain quality control, with 2,800 bottles distilled at one time. It also allows Oyazato, 55, and her colleagues to combine flavor with quality. Each of the nine herbs is introduced into the awamori base separately, and in varying quantities, to control that flavor element. Of course, the exact amounts of each ingredient are the trade secrets known only to mom and daughter. Daughter Yuko Apsato, 32, works with mom on the operational side, insuring the herbal awamori is perfect. Her brother Shigemori, 30, is the sales and marketing agent. 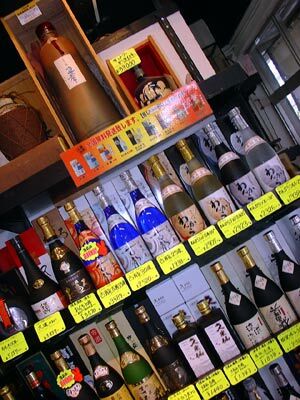 To date, 170 stores nationwide carry the Genkoku, with most still in Okinawa. The plan is gradual expansion. At the same time, the family is working on a new product, a non-alcohol spinoff to allow everyone to enjoy the medicinal effects of Genkoku. They insist the values are many. Licorice helps with lower back pain, sore throats and liver function improvement. The matrimony vine works against cough and hypertension, while cinnamomum Okinawense relieves pain and cuts perspiration. Poloyporaceae improves blood circulation, while lobster eucalyptus serves as a disinfectant. Termeric improves appetite, aids women with irregular menstruation, and promotes liver detoxification. Sufflower relieves constipation, improves blood circulation and is beneficial for women during menstrual cycles. Reishi helps guard against cardiac disease, indigestion, bronchitis, hepatitis and hemorrohoids, and gardenia jasminoides improves sleep patterns and helps with recovery from fatigue. 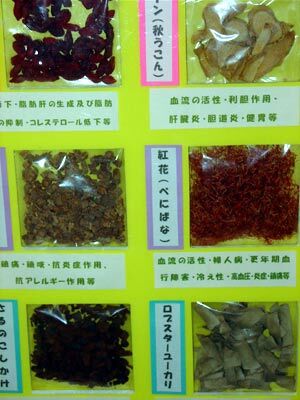 Oyazato says each of the medical herbs has a long history with Okinawans, who hold many records for longevity. Genkoku awamori is a brilliant golden color, unlike the light brown traditionally associated with awamori containing supplemental ingredients. Creator Oyazato says a perfect end to a day is to drink a small cupful of Genkoku before bedtime. Who wants to drink medicine? Well, Oyazato says there are many people who do, because it is a delicious beverage. And it doesn’t taste like medicine, either. At 20% alcohol, it fits right alongside other awamori, each with its own distinct taste as well. As with all awamori, there are several ways to partake. For a rich and full flavor taste, pour several capfuls into a glass and drink it. Others prefer it “on the rocks” for a smooth and light taste. A third way, ‘oyu-wari’ involves mixing Genkoku with hot water. It goes particularly well this way during the cool winter season, backing the alcohol off a bit while releasing flavor and aroma. Oyazato says there’s one other way to serve Genkoku, and that’s mixed with cocktail bases such as tonic, soda or fresh juices. She says the best matches are tomato juice, orange juice and milk. Genkoku. A new addition to the Okinawa awamori family. It’s sold in liquor stores in most Okinawa communities, selling for Y3,990 per bottle.